One of it's goals is now "to factorize numbers of 70-130 digit length which are needed to bring Aliquot Sequences to a size of 130"
Just in case someone (like me) missed it, YAFU now has a bunch of new badges. Unfortunately I do not have any of them. Must fix that! Hmm...YAFU. Know nothing about it as of right now but I'll change that. It is a math project. Also if you are not already registered, they are not accepting new members. I do not remember the invite code. Last, they are not sending work at the moment. Server status shows there is work but I tried on Win10 and Linux and got "no work sent". Maybe they are between sequences as they just finished one. Also, GOOGLE went into meltdown visiting this site, they have classed it as a phishing site. I have never had a problem before, so maybe its because I have the latest update on Google Chrome Web Brower. Yes, with the last Firefox update I get a big red screen saying it is a deceptive site and I have to override it to get there. I still cannot get work. I do not know if my firewall is blocking it or the site is not sending. BOINC just says "no work sent". Not worth looking into it and I'll put the badges on hold. YAFU isn't accepting any new crunchers. So I've started a new project...this one. WOW....is it a low credit project! I thought Cosmology was bad! AND....it's a multi core project so on my Threadripper...BAM...8 cores out of action to crunch one task. LOL. Oh well...all fun I guess. I've just dipped a crunching toe in. I'll get around to giving it a red hot go one day soon. So many priorities! Looking forward to a new badge one day though. I do Yafu from time to time and it is very slow and uses all the coes if you let it. It is better now they have tthee different apps for the cores it uses. Is there any hints or tips I should know about? Like Primegrid? My threadripper is doing one 8t task and so far it's shaping up to take 23hrs!! I better get some appropriate credits for that! Hey Chooka03, dip your toes in TN-GRID, its a medical research project and it gives out badges lol. Now I hear you saying, why Tazzduke, I be saying cause we are in a Boincstats Challenge and we need all the help we can get lol. I am not running any at the moment but that does sound like a long time. Although the server_status page says that the average for a 8k tasks is 7.76 hrs and can take from (0.01 - 84.26) hours. @Tazzduke - Mate...believe me...I love challenges. I really do! I miss the AA's and I enjoyed TdP but the only reason I picked YAFU is because I'm trying to get all of our team projects into the top 30. 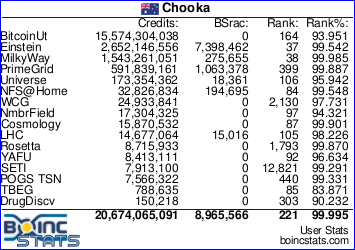 Hey Chooka03, you should see our Formula Boinc rank, its a bit depressing at the moment, but am sure we will gain a few spots over the months, well its a marathon not a sprint lol. Hey Dingo, surely there's got to be a trick to these WU's? My 4c/8t CPU is crunching 1x 4t WU and it's going to take around 16 hrs to complete! Surely that's not right? How long are your 4t tasks taking? Do you cut your CPU usage to 50% like they do with primegrid? Edit - All good. I found your name. Seems to be the same as mine.